The blended aroma of garlic, fennel, red pepper, and other herbs and spices filled the oven-warmed air, while the floor-to-ceiling windows showcased three-foot snowbanks just outside on the cold clear day. About two dozen foodies gathered last Thursday at the Action Kitchen at the Seaport Boston Hotel for an Extra-Virgin Olive Oil cooking lesson sponsored by the European Union, the Italian Department of Agriculture, and Unaprol, Italy‘s largest association of olive growers. Looking forward to putting to special use the bottle of LaRambla olive oil given to me by a nice manager at Carrabba’s, I was happy to have the opportunity to learn some new recipes. Sipping wine and Perrier, we gathered around the three workstations, two with gas ranges and one with an induction stove. Assigned to make Pecorino & Black-Pepper Oven Fries, my partner and I chopped pounds of russet potatoes, an easy task with good sharp knives. 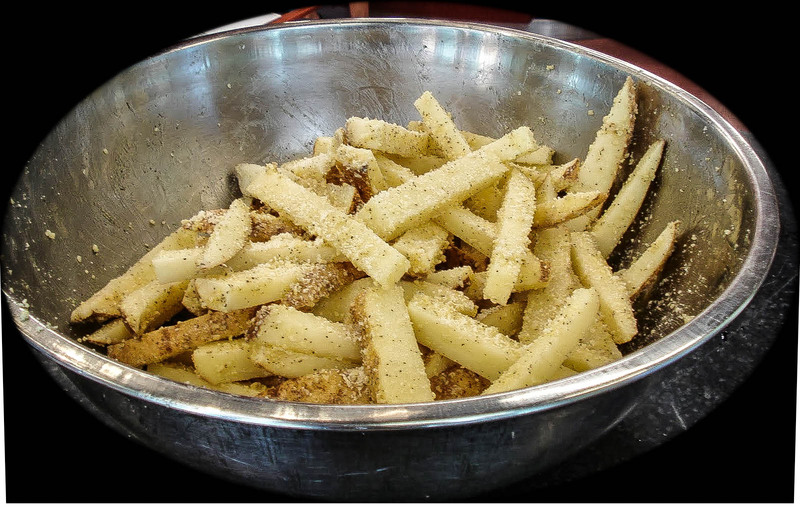 Working under the direction of one of the Kitchen’s chefs, we then dressed the fries with a generous amount of Bellucci Premium Olive Oil, as well as the coarsely grated cheese and black pepper, and then baked them for 40 minutes at 425 degrees. The other team at our workstation made Savory Olive-Oil & Herb Biscotti, while groups around the Kitchen produced dishes like Prosciutto-Wrapped Roasted Asparagus with Spicy Tapenade Aioli and Mini-Kale, Scallion, & Spicy Chorizo Cups. Once everything was ready, we sat down to lunch at three large tables in the dining area off the main Kitchen. While the flames danced in the gas fireplace, the pleasant staff served wine and the food we had just made. Sadly, the Fries were my least favorite, as they tasted a tad dry; perhaps letting them marinate longer in the olive oil would have helped. 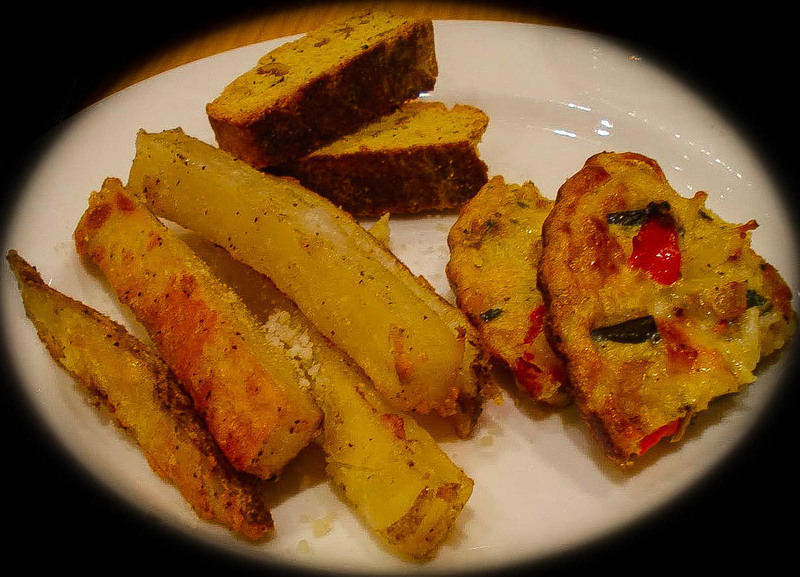 My favorite was the Pasta & Vegetable Frittata Wedges, the angel hair giving a slight heft to the eggs, cheese, and veggies. Having recently discovered the pleasure of baking my own Ciabatta, I’m also looking forward to serving the Tuscan-Bean & Tuna-Salad Crostini at one of my cocktail parties; the good quality olive oil came through especially well as the base for the dressing in this dish. 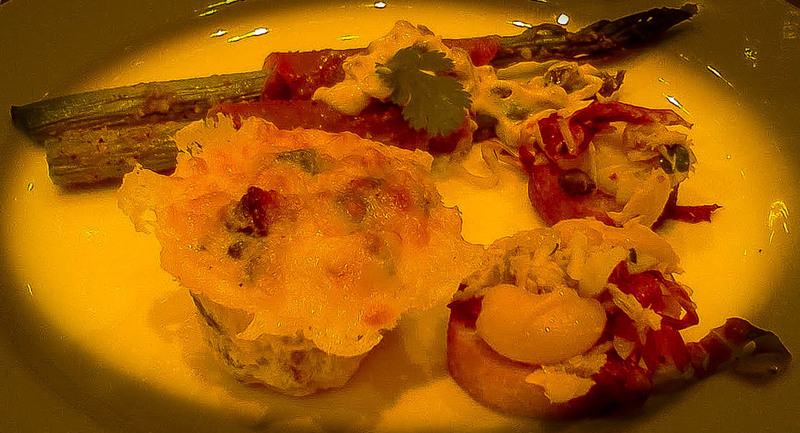 The portions were small, just enough to get a sense of each dish. But they were packed with the flavor of good ingredients, and reminded me of the lesson I learned years ago in Paris: A small amount of excellent is more satisfying than a large amount of mediocre, a principle that applies not just to food but to most if not all life’s sensual pleasures. After lunch, I walked back to my car in the cold Boston air feeling warm and sated.